Once your gate is chosen, our expert team will install it while adhering to the highest standards of safety, efficiency, and customer service. Your driveway and yard will be unharmed during the process, and our friendly customer service team will work with you to make the process simple. Since 1964, Rustic Fence has been the industry leader for fences and gates in Arlington, TX. We pride ourselves in crafting beautiful gates made with the highest grade materials and with the finest craftsmanship possible. If you’d like a new slide iron gate for your residential property, or if you’d like us to upgrade your existing gate, call us today for a free estimate. At Rustic Fence, your satisfaction is our guarantee! Slide gates are the perfect addition to any driveway, yard, or enclosure. Not only do these gates add a nice aesthetic touch to your property, they also help to greatly increase the safety and comfort level in your area. 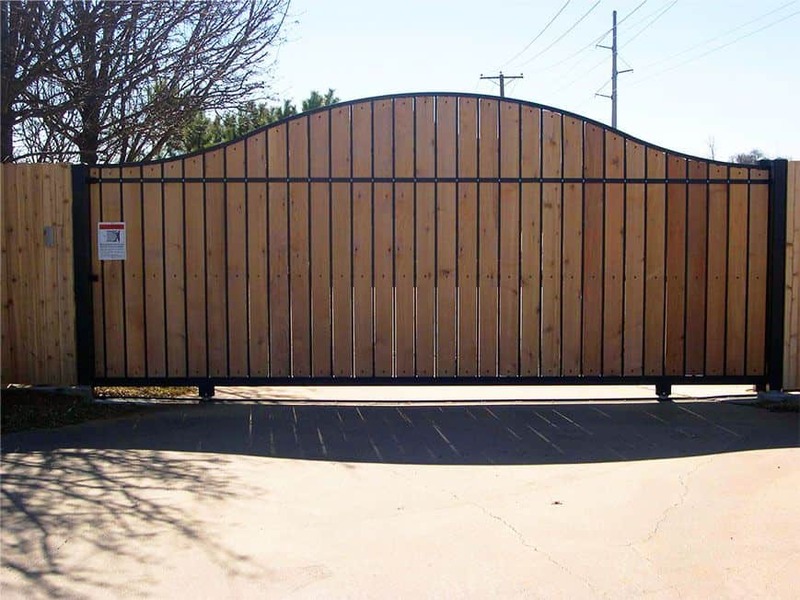 At Rustic Fence, we craft customized slide gates using a variety of materials including iron and wood so that your new gate fits in perfectly with its surroundings! Some of our designs have come with unique ornamental iron signifying family symbols, state symbols, and other creative details. We will work with you to create a gate that fits you best including the color, size, shape, and how the gate will slide open. Along with sliding gates, we also offer swing gates that may work better for certain areas. We offer a free consultation and estimate so that you know exactly what to expect, and our experience allows us to recommend a gate that works perfectly with your property and desires. Plus, we provide extended warranties on all of our slide gates so that you can choose with confidence. Your ornamental iron walk gate deserves to be special. While you want it to be strong and durable, you also want it to fit in with your home, business, or yard. With Rustic Fence, you are guaranteed to have the best ornamental iron walk gates around DFW! We pride ourselves on our work, and we know that you will love your new ornamental iron walk gate. Whether you choose one of our popular designs or have us create a customized one just for you, your ornament is guaranteed to withstand the test of time while blending beautifully with your property! We always utilize adjustable hinges so that your new gate remains easy to fix or enhance. Many of these latches are childproof as well so that you never have to worry about children entering a swimming area or other similar place. your property safe by preventing cars or intruders from entering. Whether for a home or commercial property, Rustic Fence provides the highest quality iron entry gates to ensure complete satisfaction! We also offer slide and swing style gates so you can choose which method is best for your property. Our goal is to provide you with a gate that you can confidently trust. For more than 50 years, our expert team has honed the creation of iron entry gates along with perfecting the installation process. Your gate will be installed so that you can quickly enjoy the benefits of its protection and beauty. Plus, we offer warranties on all of our gates so that never have to worry about its lifespan. are fit for tiny home along with high-security prisons and large industrial areas. We create long-lasting galvanized gate frames that aid in both longevity and strength to keep your gate from being compromised. We also can install your gate using slide, swing, or cantilever openings. At Rustic Fence, your security is our top priority. 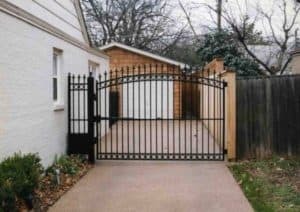 Whether you desire a chain link gate for your yard or for a larger commercial purpose, we will work with you to craft a gate according to exact specifications. We use only the highest grade commercial materials so that you can completely trust in the security of your gate. Our expert crew will install your gate using state of the art methods to ensure that it protects you for years to come. To guarantee satisfaction, all of our chain link gates come with a complete warranty and quality assurance. 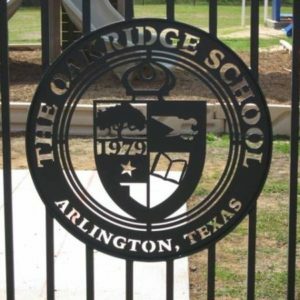 For over 50 years, we have been honing the art of crafting and installing chain link gates for commercial and residential areas. We understand that you need only the strongest and most secure gate, and since 1964, we have been creating just that. Contact us today for more information and a free estimate. 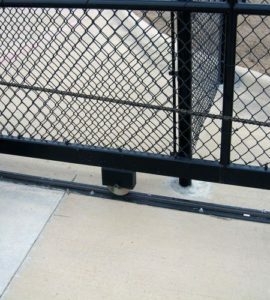 At Rustic Fence, you are guaranteed the highest quality chain link gate in Arlington, TX! (817) 275-2151 or (972) 725-7984.